Amongst the local history books at the Heritage Service is a small pamphlet entitled “Belgian Refugees Garden Party 1915”. 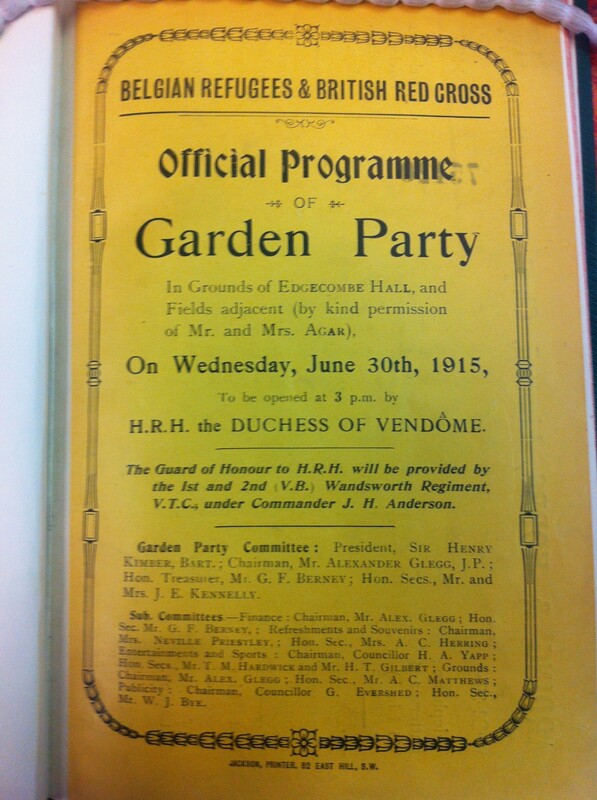 This is a copy of the official programme produced for a garden party held in the grounds of Edgecombe Hall in Southfields on June 30th 1915, which was opened at 3pm by HRH the Duchess of Vendôme. On arrival, she was to be greeted by Sir Henry Kimber, Alexander Glegg and the members of the Reception Committee (who aren’t included in the list of Sub-Committees on the front page). Flowers and a souvenir programme were to be presented by Miss Phyllis Houdret and Master Neville de B Priestley. Tea was available, as were light refreshments “including Fruit Salads Ices, Strawberries and Cream, Lemonade, Ginger Beer, Coffee, Sandwiches &c”. Responsible lady helpers were supervising children who were selling souvenirs of all the Allies and sweets. 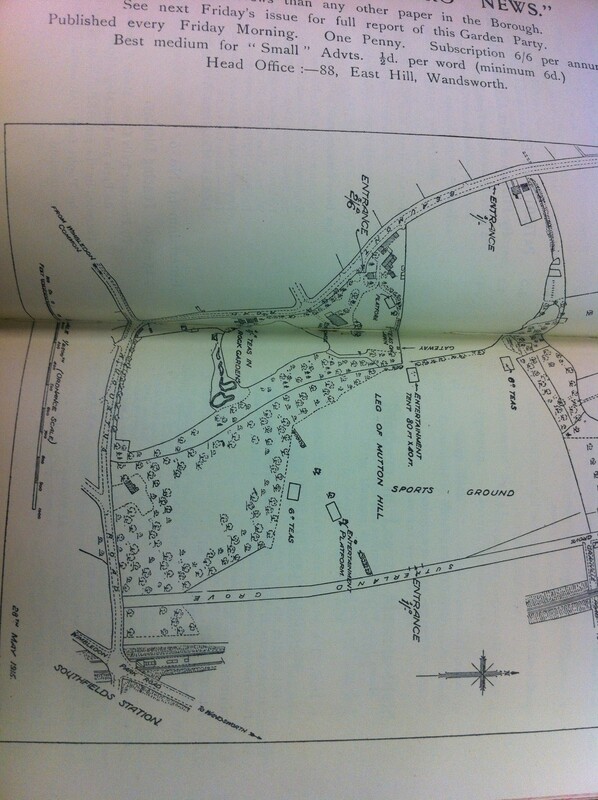 On the map of the site were both an Entertainment platform and an Entertainment Tent. The platform started with the band of the Holborn Industrial Schools, playing a selection of Belgian pieces and British war songs, followed by a Pastoral Play, a Hat Trimming competition for Gentlemen and a Nail Driving competition for the Ladies, amongst other things, closing with the prize distribution. Over in the Entertainment Tent, in what may have turned out to be the better location, were a series of musical performances, including pupils from Putney County Secondary School, the Jean (Belgian) Quartet and a concert featuring dance and recitations. Another platform in the Edgecombe Hall grounds had dance, fencing and a concert and Maypole dance. Rather unfortunately, no sooner had the Duchess arrived than there was a clap of thunder and torrential rain started – and continued for the rest of the afternoon. According to the Wandsworth Borough News, this washed out some of the carefully prepared refreshments, but as much of the entertainments carried on as possible. The girls from Putney County Secondary had to march over in the rain, but reportedly gave a fine performance – luckily in the tent. Edgecombe Hall’s owners opened the house up as well as the grounds, and the Duchess took shelter there – having to decline a tour of the grounds on account of having a cold and not wishing to make it worse. Various sports carried on regardless, with particular mention due to Winifred Crewe, who took part in all 4 girls races, coming 2nd in the 100 yards and the skipping race but claiming first prize in both the egg and spoon and potato races.